Ultimate General: Gettysburg is a Real Time Strategy based on the famous Battle of Gettysburg from the American Civil War. A whole game centered around one battle of history is a pretty unique concept, but does it hold up? Is it able to keep from being stale? I think yes. The controls are simple enough, simply click on a unit and drag towards where you want them to go. An arrow will be painting on the screen to show you where they are headed, and will remain on screen till they arrive at their destination. The only downside I didn't like to this method was sometimes it seems to work against you if you try to loop back. Like say you have an artillery unit and you want to make it turn once it is in place to face the enemy. I found trying to do a small turn will make it try to undo the path as the game thinks you are trying to erase the line. Otherwise the controls work well enough. There are buttons on the side to halt, fall back, or tell the troops to hold the position. The map is incredibly well recreated, most history fans should be pleased in that regard. little points on the map representing farms and such can be used as cover by your troops. Troops also have to reload, and get tired after marching a long distance. You'll be at a disadvantage if you march your units halfway across the map and engaged with a foe that has been waiting for you. It also takes into account elevation regarding aim. You can use the M key to toggle very helpful elevation lines. 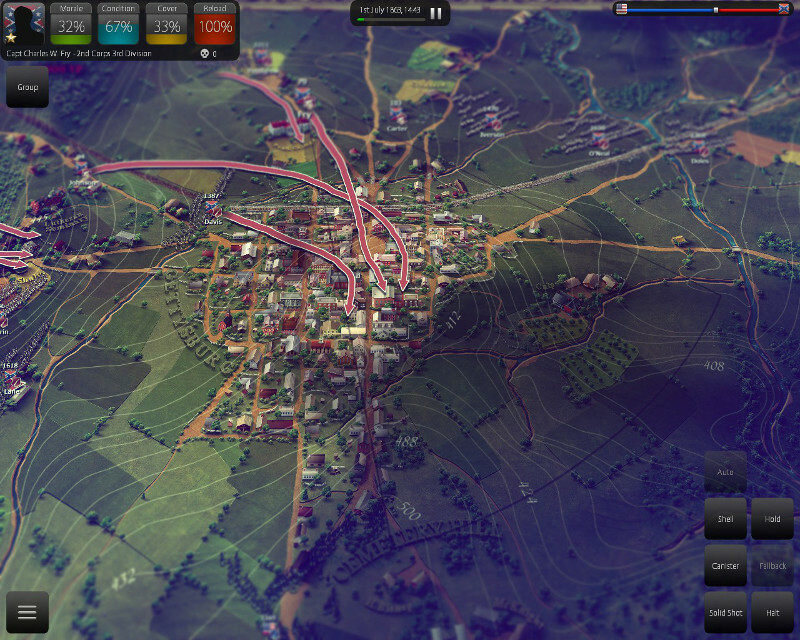 I loved using the elevation lines to find the highest points to place my artillery to bombard the enemies. The graphics are fairly plain, however, with the units being simple (and somewhat tiny) sprites, though I do feel they suit the game. Once I got into it I wasn't too concerned on how things looked. There was just too much going on. The game sounds great for what it is, occasionally hearing the Calvary charge playing or the sounds of the gunfire. After a battle the ground will be littered with little tiny corpses. Unlike other games where you build and resource manage, this one is purely about battling with the units you have and holding out until reinforcements arrive, and capturing strategic points on the battle field. You can play as either the Union or Confederacy, and the AI has 9 different settings varying in difficulty and aggressiveness. I had the most luck playing against the AI on the risky behavior setting, getting a couple of epic victories. When playing against the more defensive, cautious AI, I was wiped out on the first day. All the settings provided for a unique challenge and it will be fun replaying and trying to win against them all. The interesting thing about the game, is how the battle is broken up into several days. As you fight, a timer counts down. Eventually a message will say both armies are exhausted and need to resupply, then you will be told your various degree of failure or success. A crushing defeat led to game over for me. An epic victory led me to a better position in the following battle. Draws or slight defeats will allow the game to continue but you might be in a not so advantageous setting. Events will happen as you play. You might have the upper hand then the Iron Brigade shows up and now you are having a bad day. Or maybe something caused your reinforcements to be delayed. Things are constantly happening and changing making you have to be very aware at all times. 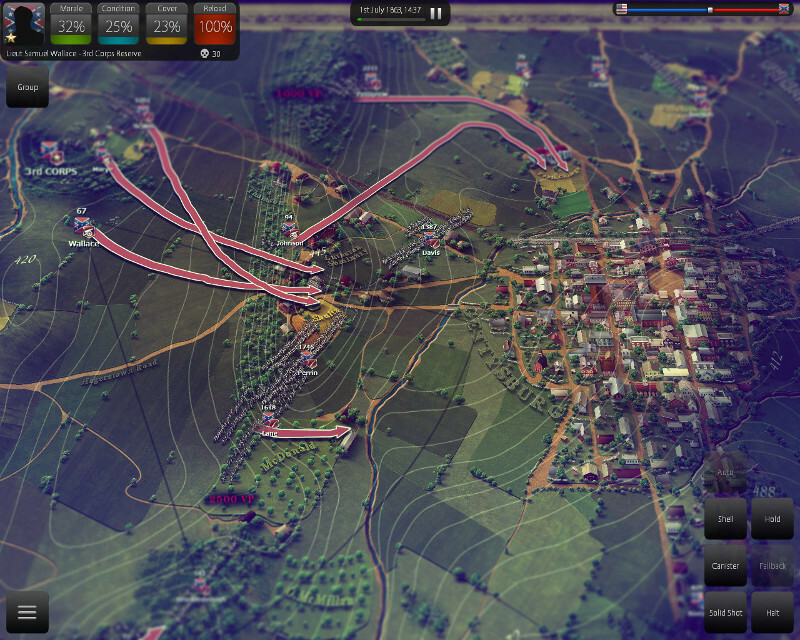 After each battle you will get a briefing of what to do next, such as capture Cemetery Hill and push the enemy further south. Sometimes, you get choices after a battle on what you would like to try next. One option I had was to let my army rest before attacking, or pursue the few union troops left. It gives a warning if you choose the option to rest, that the Union may act else where, and interrupt your plans. I found this to be a very fun and unique take on the genre.With the different AI settings (there is an option to boost it further if the default isn't challenging enough for you) and and the branching battles, this would be one fans of historical real time strategy games would definitely want to check out. Will history repeat, or will the south rise again? With games out there like Starcraft 2, Civilization V, and Total War: Shogun 2 it just isn't viable to play Genesis when it feels stale and unfinished. Even for fans of the books or show it just isn't a good enough game, even in the fan service perspective, to go out and spend $40 on. Do yourself a favor and read the books, then go play a better strategy game. Ageod's grasp of the history of war is epic in itself, and this title's exploration of the Roman civil war is nothing short of masterful. Those in love with historical strategy, or a fan of their earlier titles, will find AJE, both familiar and challenging, while those uninitiated with these types of games will find this a very, very tough nut to crack. I, unfortunately, was a member of the latter group.